The binding of this book suggests that the report comes from 1868, but the text of the report implies a date of about 1822. 1822; the present trustees are the Rev. James Reed, the rector, and others. It appears, by recitals in the different deeds of conveyance, that the trusts of the charity are to apply the rents and profits of the estate to the reparation of the parish church of Eversholt, for the relief of the poor people of the said parish, and for the aid and ease of the said parish in their common town charges; the church and poor in the first place to be provided for, according to the true intent and meaning of a decree theretofore made concerning the premises in His Majesty’s high court of Chancery. 1. A messuage, farm, barn and outbuildings, and 107 acres of inclosed land, arable and pasture, all lying together, except one close of four acres, which lies detached. The land was allotted on the inclosure of Eversholt, in 1808, in lieu of other lands, formerly belonging to the feoffees, and with the exception of the close of four acres, is let to John Daniell, on lease, for 11 years from Lady-day 1817, at the annual rent of £110. The lease was granted on tender, and the present rent is the full annual value. The Four Acre Close is let, together with a small cottage belonging to the trust, to Thomas Foxley, as yearly tenant, at £7, which is about the yearly value. parish poor, with a garden of one rood, or thereabouts, attached. per annum to Thomas Reddall, as yearly tenant, being the full value. The total income is at present £142. per annum. One of the feoffees is appointed, together with a substantial householder in the town, who is not a feoffee, once a year, on Whit-Monday, to superintend the application of the rents, and keep the accounts. The acting feoffee and townsman are chosen by the feoffees, at a yearly meeting. This mode of administration and management is agreeable to established usage. many years past, to give to each poor family belonging to the parish, one hundred weight of coals annually, together with 1s in money. The distribution is made by the trustees on St. Thomas’s day. 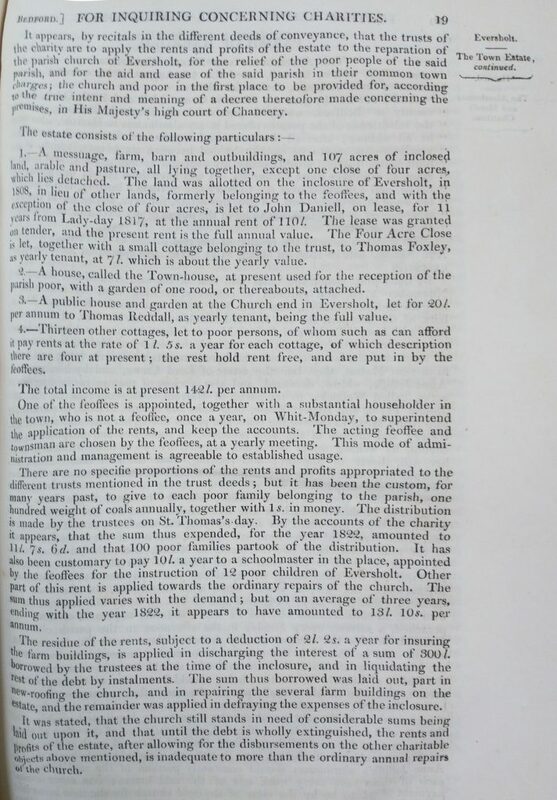 By the accounts of the charity it appears, that the sum thus expended, for the year 1822, amounted to £11 7s 6d and that 100 poor families partook of the distribution. It has also been customary to pay £10 a year to a schoolmaster in the place, appointed by the feoffees for the instruction of 12 poor children of Eversholt. Other part of this rent is applied towards the ordinary repairs of the church. The sum thus applied varies with the demand; but on an average of three years, ending with the year 1822, it appears to have amounted to £13 10s per annum. The residue of the rents, subject to a deduction of £2 2s a year for insuring the farm buildings, is applied in discharging the interest of a sum of £300 borrowed by the trustees at the time of the inclosure, and in liquidating the rest of the debt by instalments. The sum thus borrowed was laid out, part in new-roofing the church, and in repairing the several farm buildings on the Estate, and the remainder was applied in defraying the expenses of the inclosure. It was stated, that the church still stands in need of considerable sums being laid out upon it, and that until the debt is wholly extinguished, the rents and profits of the estate, after allowing for the disbursements on the other charitable objects above mentioned, is inadequate to more than the ordinary annual repairs.